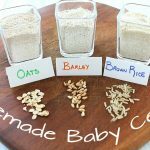 Preparing homemade healthy baby food is simple and as your baby portions are very small (most of all at the beginning) you will easily find yourself with a nice quantity of leftovers. 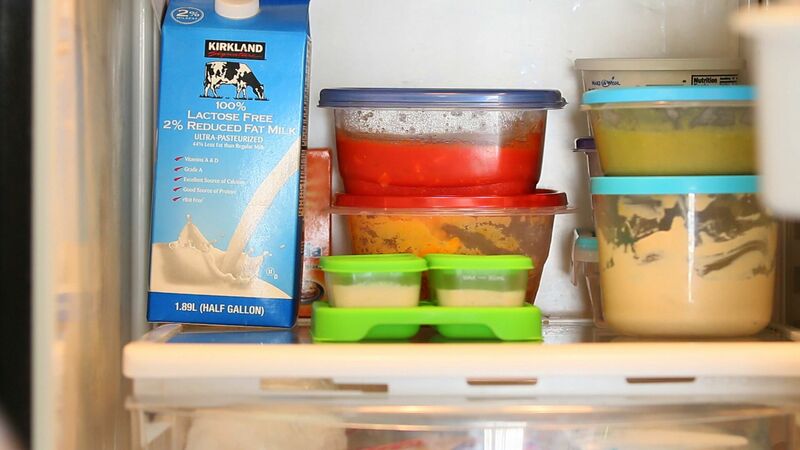 That’s why it is very convenient to store your baby food either in the refrigerator or the freezer. It will save you a lot of time and you will not waste a single spoon! 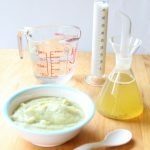 Here you are few basic concepts and replies to common questions about freezing baby food that I learned through the years cooking for my kids and preparing baby food recipes for my blog. WHERE TO STORE BABY FOOD? WHICH CONTAINER TO USE? 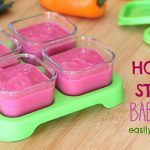 In addition to that baby food containers are made of baby safe materials (glass, silicone, bpa free plastic) and designed to be as much functional as possible (trays, lids, handles…everything is designed to make your life easier). You can fill them with the baby food and close with the lid. Store it in the freezer and pop up the needed quantity once needed. 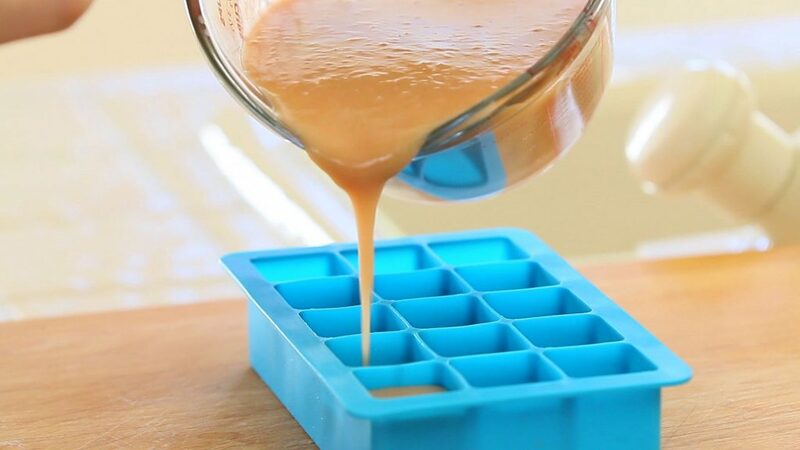 If you want to save money and space in your freezer, you can always freeze one tray; after few hours, when the baby food is completely frozen you can pop up the cubes and store them in a freezer safe plastic bag that you will place back in the freezer. 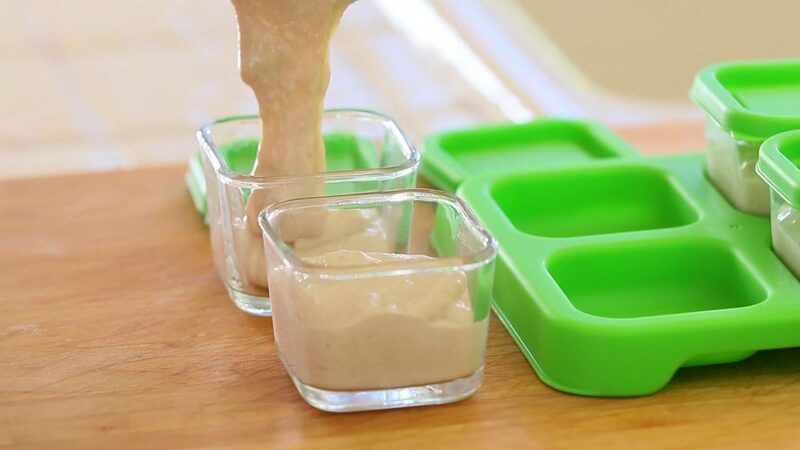 You can now fill the tray with a new batch of baby food. In this way you can buy one or two trays/mini pots only. The glass containers come in different sizes and you can reuse them in the future to store small food leftovers. For example I freeze already minced herbs like parsley, basil, thyme…ready to use for my recipes!! 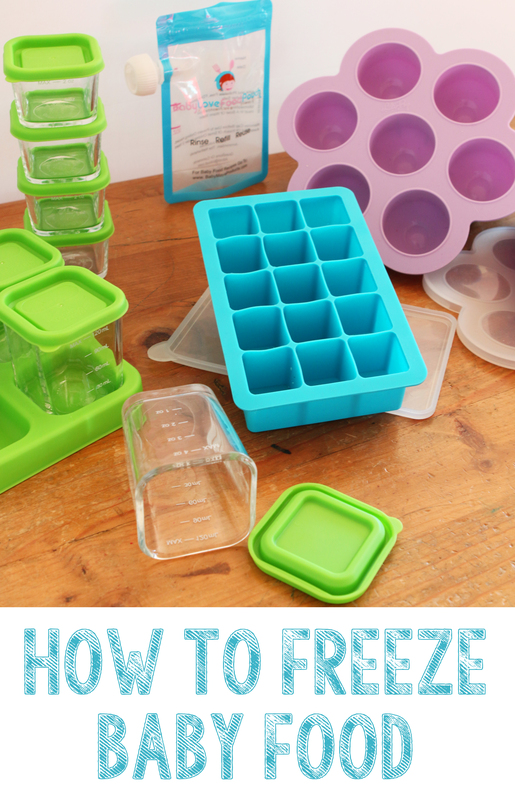 Just a reminder: not every glass container is freezer safe. Some kind of glass do not stand low temperatures and easily break once frozen. Double check on the packaging or on the manufacturers website if it is freezer safe. Also, commercial baby food jars are not freezer safe (if not stated on the packaging). 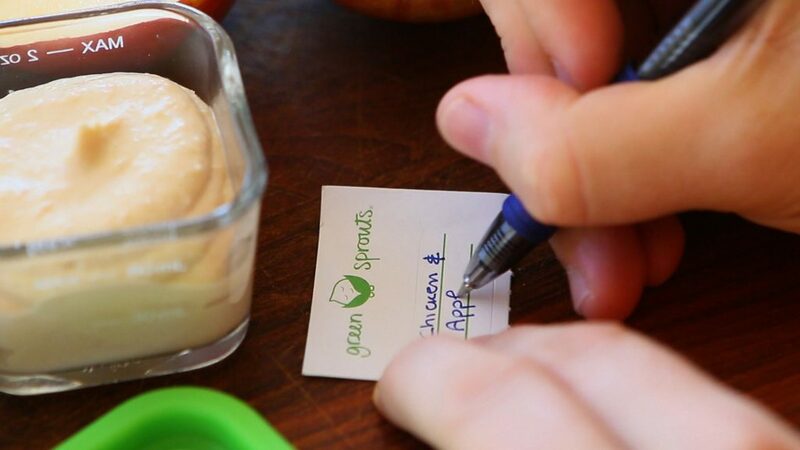 The glass containers that you see in the video are from Green Sprouts, they are available in two sizes: 2 oz. and 4 oz. Thanks to the wide zipper-opening at the bottom it’s really simple to fill them and clean them. I particularly like them for very running or liquid food (applesauce, yogurt, smoothies). The strong and eco-friendly material allows for repeated use. I’ve been using mine for more than one year now and they are still in very good shape. The “spoon” extension is very useful. The pouch solution is very convenient when you have to feed your little one on the go. It really helped me during my flights to Italy with the babies or during our picnic at the park. CAN I USE A CONTAINER WITHOUT A LID? It’s not recommended. 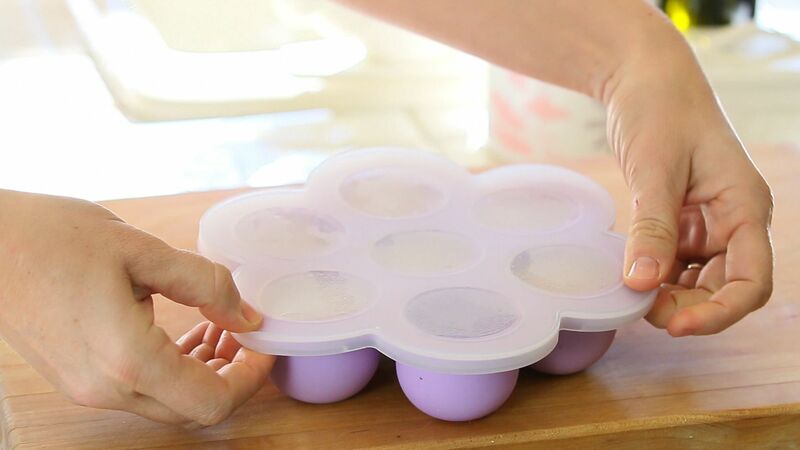 The lid keeps the food away from being freezer burned. Freezer burn is not dangerous, it means that the surface of the food gets dry (burned looking) and you will need to remove it before serving the baby food (wasting precious healthy food!!). 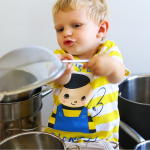 Another good reason to use lids it to protect your baby food from other food odors in the freezer or refrigerator. Once your baby food is ready, freeze it as soon as possible to preserve freshness and avoid the growth of dangerous bacteria. 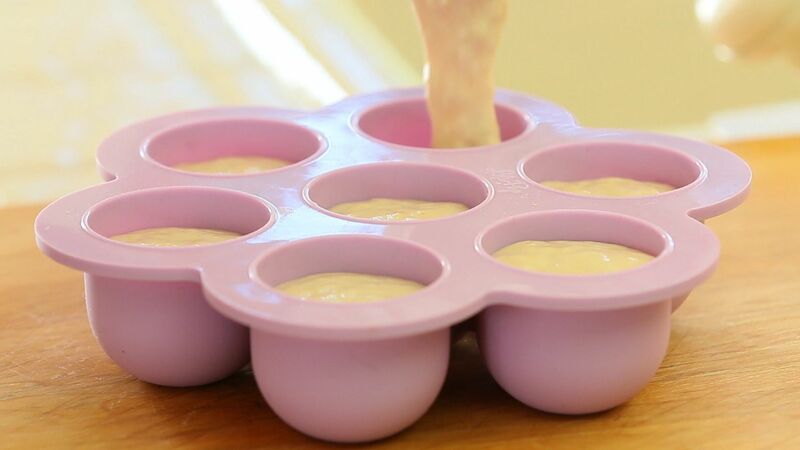 If you cook your baby food and it needs to cool down before freezing it, it’s fine but remember to freeze it as soon as it reaches room temperature (preferably within one hour). As a general rule NEVER leave your baby food on the counter top at room temperature for more than 2 hours. 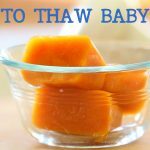 FOR HOW LONG CAN I STORE BABY FOOD? Freezer: the general recommendation is to freeze your baby food up to 6 months. My personal suggestion is to serve it to your baby within 3/4 months. 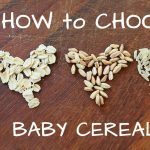 Your baby is growing and his food taste might change in terms of texture. He might like very running purees but in few months he might switch to a small chunk consistency. Also, the baby food taste might slightly change with time. 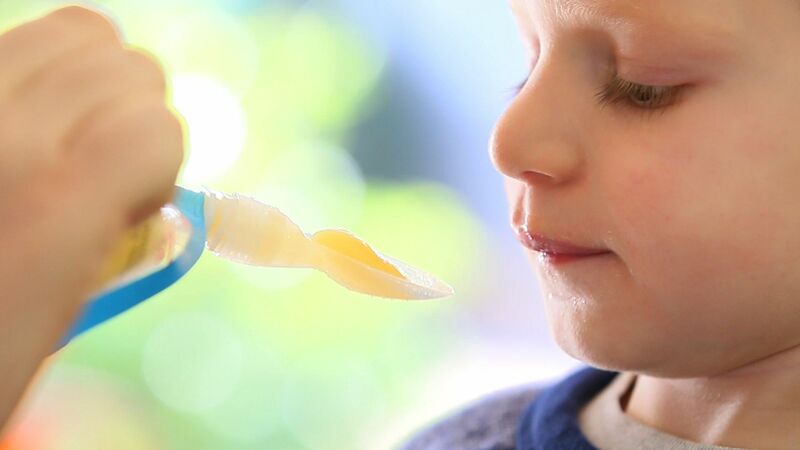 It will still be safe to serve a baby food frozen for 6 months, but the taste could be different. Refrigerator: 2/3 days for fruit and vegetables. 1/2 days for meat and fish. 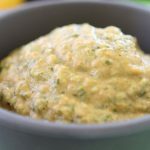 CAN I FREEZE A BABY PUREE THAT HAS BEEN PREPARED USED FROZEN INGREDIENTS? We all know the rule of “never freeze twice” the same ingredient, but what about a frozen ingredient (ex. 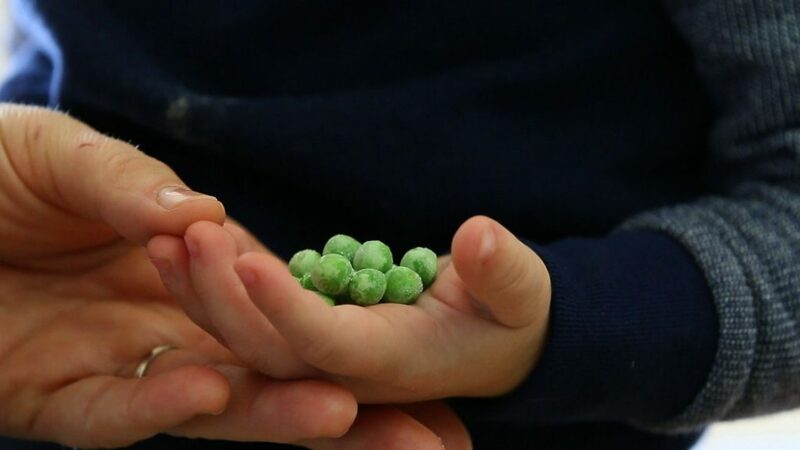 sweet peas) that has been cooked and transformed in a baby puree’?? The concept is that you should not freeze twice ingredients that have already been cooked once. 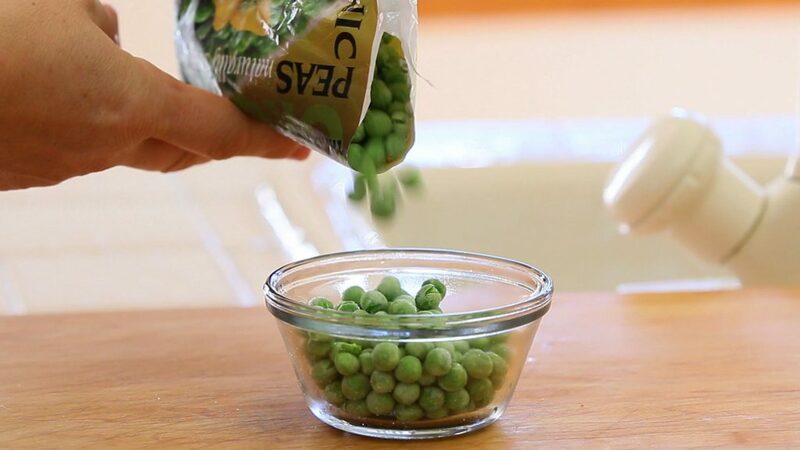 If you are using frozen fresh fruit and vegetables, yes, you can refreeze them. They have been frozen from a very fresh state and they have never been cooked before. What about meat and fish? Same rule. 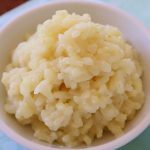 Raw and fresh meat/fish can be frozen, than thawed, than cooked and turned in a baby puree’ and than frozen again without any problem. CAN I FREEZE FOODS CONTAINING BREAST MILK OR FORMULA? Yes, you can freeze foods containing breast milk, but you should never freeze any foods containing previously frozen breast milk. Basically breast milk can only be frozen once. Same rule for baby formula: you can freeze purees containing freshly made formula, but it is not recommended to use previously frozen baby formula to make a baby puree and than freeze it. 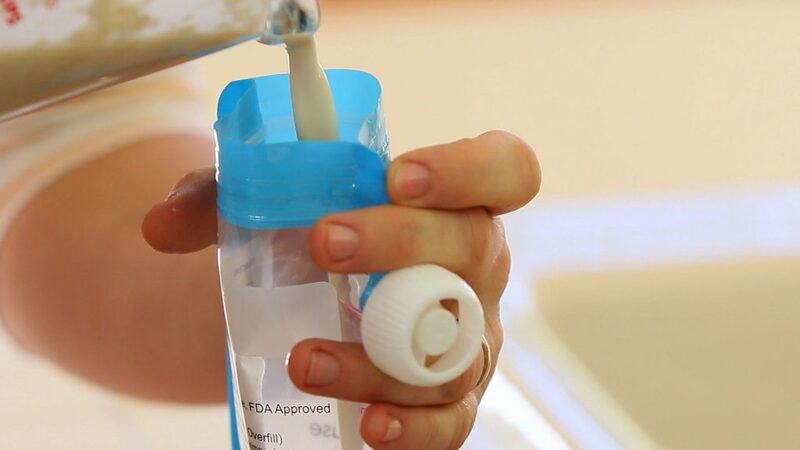 Also remember than when freezing baby formula the nutritional value will NOT be affected, but the consistency will. The cold will separate the fat in the formula so that the texture will change. Your blog and recipes are amazing. Thank you for teaching me so many ways to feed my boys.